Marine archaeologist and researcher at the Centre National de la Recherche Scientifique (CNRS) in France, Giulia Boetto, has announced the incredible discovery of a boat wreck in Zambratija Cove, Croatia, which has just been dated to 1,200 BC . The unique and rare finding is a Bronze Age sewn boat, a type of wooden boat which is literally sewn together using ropes, roots, or willow branches. The boat wreck was first seen by fishermen in 2008, just 600 metres from the beach and only two metres below the surface, however, they believed it to be a fairly recent wreck. Giulia Boetto, and two of her Croatian colleagues, Ida Koncani from the Archaeological Museum of Istria, and her husband Marko Uhac from the Ministry of Culture, investigated the site and believed the boat to be quite old. Initial dating led to the surprise discovery that the boat was from pre-Roman times. The research team returned to the site in 2011 to take further samples and to conduct more rigorous analyses. 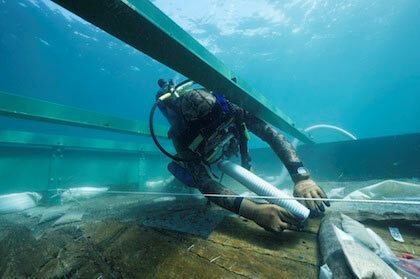 Finally, results of radiocarbon dating have revealed that the boat dates to a much earlier period – the 12 th century BC. Ms Boetto described the finding as “an extraordinary discovery [translated]”. She added, “It is extremely rare to find a wreck dating from the Bronze Age [translated]”. The boat measures 7 metres in length and 2.5 metres in width and is a sewn boat, which was a technique of shipbuilding practiced in the Adriatic until the Roman era. 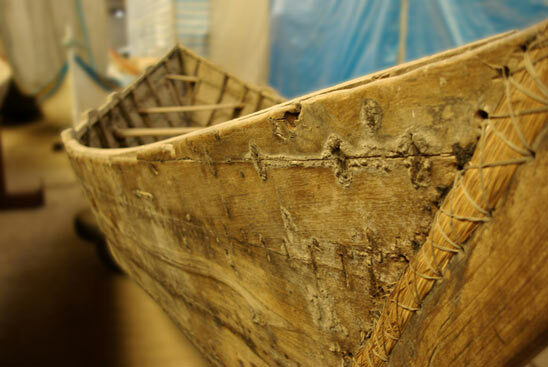 Sewn boat construction techniques were used in many parts of the world prior to the development of metal fasteners, and continued to be used long after that time for small boats to reduce construction costs where metal fasteners were too expensive. Carefully shaped planks are connected at the edges with overlapping sections, which are sewn together. An example of a sewn boat. Photo credit: World of Boats . The remains of the boat found in Zambratija Cove are incredibly well-preserved for its age, with stitching still visible in some areas and the frame largely undamaged. The different types of wood used to construct it have been identified as elm, alder, and fir, and tree ring dating is currently underway, which will provide the date the tree was cut to the nearest year. Ms Boetto said that they hope to finalise a 3D model of the boat and, eventually, a complete reconstruction. The boat remains underwater for now, but there are plans to move it to a boat museum in Pula once further tests have been carried out. Investigating the Submerged Prehistory of the Eastern Adriatic: progress and prospects in ‘An Offprint of Submerged Prehistory’.